In the world of IBG-PASS Pro Stock (Super Late Model) racing, there are some real personalities. Living legend Mike Rowe is still showing the young guns how to get the job done, scrappy Tracy Gordon is a woodsman from the mountains of Maine who shows up for the races that he feels like running – he doesn’t get pushed around easily, Ben Rowe is the family man who wins races and championships seemingly at ease, Johnny Clark is the young defending champion who is throw back to a simpler time in racing, Scott Mulkern is never afraid to speak his mind, Cassius Clark is not afraid to race hard and then, on occasion, there’s part-time competitor Ted Christopher. Need we say anymore about him? around quite a few red-blooded American males who probably watch NASCAR Nextel Cup races religiously and venture out to their local short tracks on Saturday nights as well. Dearborn day job is to run a gravel pit for his family’s construction company. 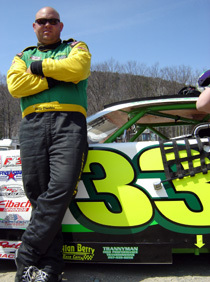 Heavy trucks come in and out of the front gates all day and unless their operators take a close look at Dearborn’s truck and see a small #33, they would have no clue that he races, and wins, in one of the premier short track series of the Northeast. So when Dearborn broke through to victory lane last season, a lot of people around the track were also quietly cheering him on. But whether or not it’s the Hanley car, the Port City car or anything else that his team can put together, Dearborn was bit by a bug when he won at Lee and now he’s driven to repeat that performance as often as possible. 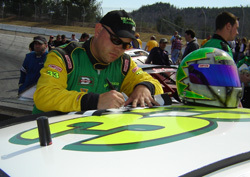 So far in 2005, Dearborn hasn’t won a PASS race, but it should only be a matter of time before he returns to victory lane. And when he does, don’t expect a lot of yelling, screaming and smoky doughnuts. That just isn’t his style. “We brought our old car out at the end of the year last year and won with it down there,” said Dearborn. “We had been struggling for a few years with the car that we built. We finally decided to give it up and we brought this one out of the corner. We bought it out of Canada. It’s an old Junior Hanley car. The interesting thing about Dearborn’s Hanley car is that it is better looking than most of the chassis that come out of the Canadian legend’s shop. Hanley saves weight on his cars by not painting their chassis and rollcages. But Dearborn changed that on his #33. Part of the satisfaction of Dearborn’s victory came in the fact that he used an old proven car, and not a state of the art rocketship, to win his first race. Dearborn meets fasn at White Mountain. But sitting quietly on the grid among those guys is Richie Dearborn. He doesn’t say much and doesn’t make a big production of anything on the racetrack. Dearborn is the guy at the end of the race who finished in the top five without ruffling feathers or turning heads. But more often then not, he is somewhere near the front when a race is finished. Last season, he even broke through for his first PASS victory, which came at Lee USA Speedway (ME). It turns out that Dearborn isn’t just quiet at the track. He’s doesn’t make much noise wherever he goes. 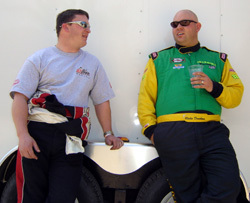 Dearborn (R) talks with fellow competitor Donnie Whitten (L).